Our Certified Caregiver Program at Providence Training Institute is approved by the Arizona Board for Nursing Care Institution Administrators. It is a 104-hour program comprising of classroom time and clinical skills lab. 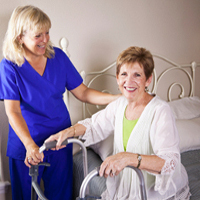 We train students in both didactic and clinical skills required to be a licensed by the board and to be a successful and knowledgeable Certified Caregiver. Students will have the opportunity to take the first 26 hrs of class as a distance learning module.